Renee Scattergood is an author of dark fantasy based in Australia. She has published the Shadow Stalker series as well as a number of other books. She stopped by the blog to chat about what inspires her, what she's working on and how she goes about her writing process. Hi Renee, a pleasure to catch up with you. You're the author of the Shadow Stalker series – among other things! For readers who are just getting to know you, how would you describe the series? What's your elevator pitch? It's a story about a young shadow stalker, named Auren, who is being hunted by a former shadow stalker, Drevin, who believes she will enslave the people of their world. It's all about her struggle to survive, train as a shadow stalker in less than ideal circumstances, and eventually stop Drevin's tyranny without succumbing to his prophecy. 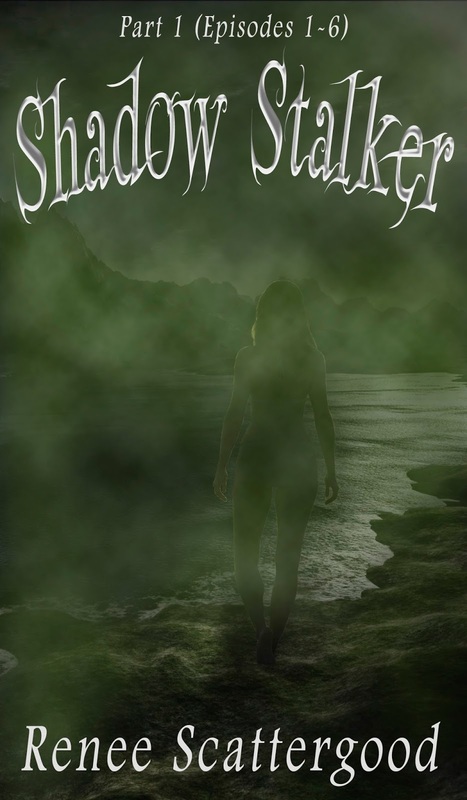 You do something different with the Shadow Stalker series – something that harks back to the Penny Dreadfuls and their serialised novels or the episodic flavour of a TV series. It reminds me of when Stephen King tried to revive that idea and published The Green Mile as a series of slim novellas that eventually combined into the larger work. What drew you to that approach? Originally, it was meant to be a series of novels, and I do still plan to write a novelization of the serial starting next year, called Savior of the Serpent Isles starting with the novel, The Galvadi Invasion. I had a few false starts with the novels and realized a lot of my problem was I lacked the confidence to self-publish a full novel, especially with a story that had been growing for so many years in my mind and had come to love. So I decided writing smaller pieces of the story to test the waters would be better for me. I also felt it would be a good way to build my writing skills on a smaller scale. I decided to write these in first person from the main character's point of view so I could really get into her head, and I wanted them to read more like a TV series. It's been a challenge, but I'm glad I did it. It's definitely helped me improve my writing skills to the point where I'm confident enough to start publishing the novels. I want to portray a broader view of the world in that series, so they will be written in third person. It's also spawned a new serial, which will begin after Shadow Stalker about how and why the shadow stalkers were created. What are the hazards of that way of writing? And, better yet, the benefits? Most people, when they serialize something, publish chapters of a larger work. I didn't want to do that. I actually wrote each episode to read like a TV series. I wanted each one to be a story within itself, and yet be part of the larger story. It was a lot harder than I thought it would be. It's more like writing a series of short stories that have to somehow fit together. You can't be as detailed as you would in a novel, so you have to do a lot more showing as well. This was actually good practice for me. One of the biggest cons to writing a serial is they are difficult to promote. While they are coming back into popularity, there still isn't a very large audience for them, or if there is, I haven't found them yet. The benefits, while not monetary, are there though. If you are new to writing and need something on a smaller scale to help boost your confidence and skills, I highly recommend publishing a serial. It's a good way to get a feel for whether there is a market for your story without spending months on a full length novel. It's also a great way to start building your author platform. The world is one of dark fantasy – what draws you to that genre? To be honest, at first I didn't realize I was even writing a dark fantasy. It took several months to put my story into the correct genre, which made a huge difference now that I'm attracting the right audience. I've always loved darker stories though. I'm not so much into horror or thrillers. Those give me nightmares, but I love dark, mysterious and creepy. While we're talking about the things that pull you in, who would you say have been your influences? Who are the writers whose words you devour eagerly? What books made you fall in love with them? I've loved to tell stories since I was a kid and that was inspired, believe it or not, by George Lucas when I saw Star Wars for the first time at eight years old. I struggled with reading until I was about nine or ten, so I didn't read much until then. But when reading became easier for me, I couldn't stop. I read everything, but I mostly loved fantasy. The Hobbit was always one of my favorites as a kid. Most of the books I read throughout my young adult years were Star Wars or Star Trek books. I didn't read much of anything else. But when I moved to Australia, my husband convinced me to read the Sword of Truth series by Terry Goodkind, and I was hooked. I guess you can say he was the one who inspired me to get serious about writing again after a mishap that caused me to stop writing for a time. Since then I've been more inspired by some of the successful indie authors, like Lindsay Buroker, I've been reading. Writers often talk about being either a planner or a pantser, someone who has a detailed outline of their story or someone who flies by the seat of their pants and lets the story lead them – I imagine you face a different approach to many because you're building a bigger framework than just the one book. Each of yours connects to the next one and you've got to keep the continuity together. How do you go about that process? I started out as a pantser and quickly learned that was not going to work, especially for the reasons you mentioned. There's too much going on in the story to keep it all in my head. I do have the overall story for Shadow Stalker planned out in my mind. I know how I want it to end, and I think that's the most important part. I also knew I wanted to tell the story in four parts. Each part has six episodes. I've got a basic idea about what is happening in each part. So when I start the planning process, I work out the main plot for the whole part/six episodes, then I can work out "subplots" for each individual episode and start planning those. After I've got the basic story worked out, I write the scenes and separate those into chapters. Then I write a very detailed outline about the story. Whenever new information about the characters or the world pops up, I write it into my notes and I check the stories against my notes before I even start writing to make sure there aren't any inconsistencies. I do the same if something new comes up during the writing process. So far, while using this method, I haven't had any issues with consistency. You've mentioned in the past that you have a background in shamanism and that reflects a little in your writing – how does that show through? Most authors who include magic in their fantasy stories use a sorcery or wizardry type of magic. Mine is more shamanic in nature in that it is magic derived from the world of the dead, so to speak. It's something you have to be born with and you have to know how to "commune" with the spirit world in order to use it. In Shadow Stalker, all the shadow stalkers' power comes from the shadow world, and was given to them by one sect of the shadow people, the human spirits. There are rules they have to follow too, and they can have their powers taken from them if they break these rules. The collected episodes 7-12 of Shadow Stalker are now available. Do you have a long-term aim of how many episodes there will be? Where do you see Shadow Stalker, say, five years from now? There are going to be four parts, twenty-four episodes, in all, so it's half way done. I will be writing the Savior of the Serpent Isles series over the next four or five years. That will be about eight novels and it will follow the Shadow Stalker serial. Each novel will cover the events of approximately three episodes, but it will be written in third person from the points of view of several characters, giving a broader view of the world and the story as a whole. I also plan to continue writing novellas and short stories, which are offshoots of the story that feature one of the characters. I thought this would be a great way for people to get to know the characters better and see what's going on between novels and serial parts. And, as I mentioned before, when Shadow Stalker is completed, I'll be starting a new ongoing serial about the shadow stalkers and how they came to be. It will explain how humans ended up on that world and the events that led up to the shadow stalkers' creation. I don't plan to have a definite end for this one as it takes place approximately 20,000 years before the events in the Shadow Stalker serial, so I can keep it going for as long as it has readers. And looking back, for the authors who might be five years behind you and just starting out, what's the best advice you could give to them? Make sure you love what you're writing. If you don't love it, neither will anyone else. If it's not something you want to read over and over again, it's not worth writing (and yes, I do read my own stuff over and over again, and I love it each time). One of the things I really like on your website is that you have interviews with your characters – was that a way of putting your characters out there or was that a tool you used yourself to get to know them better for your writing? What prompted the idea? The idea of doing character interviews actually came from Katie Jenkins at The Book Stalkers (at the time DKC) when she planned a blog tour to promote my very first episode of Shadow Stalker. She sent me an interview for my main character, Auren. I enjoyed doing the interview so much, I wanted to do one for each of my characters. LOL, yes Episode 1 is the best place to start. Although I've given each episode a little story within itself, it's still a part of an ongoing story that won't make much sense if you start in the middle. This is part of the reason I made Shadow Stalker Part 1 (Episodes 1 – 6) free. It gives all new readers a chance to start from the beginning of the story and decide whether they'd like to continue onto the next part. Next up is the first novel in the Savior of the Serpent Isles series. I'm finishing up Part 3 of the Shadow Stalker serial over the couple of months, then I'll start work on The Galvadi Invasion in January. I hope to release it around this time next year. Thank you, Renee. One last question – well, two really, but what's on your bookshelf at the moment and what's been your favourite book that you've read this year? Oh my goodness, there are so many books. On my physical bookshelf we have the Sword of Truth series, of course, as well as Wheel of Time by Robert Jordan (my husband loves those), Dune by Frank Herbert, the Twilight Saga (yes, I love those…sigh) as well as so many others, including non-fiction titles. I also have a lot on my digital bookshelf, such as The Emperor's Edge series by Lindsay Buroker (and many others of her books as well), The Fateful series by Cheri Schmidt, and more than 100 other books. I can't even recall the titles right now. My favorite this year…wow that's a hard one. I've read so many books I loved. When I'm in full blown reading mode I can read two or three novels (sometimes more) a week and I average about sixty a year. I'd have to say my favorite so far this year was The Omen Machine by Terry Goodkind. I just love his books. They're the exact right amount of dark, mysterious and creepy for me. Renee's Author Spotlight: http://reneesauthorspotlight.blogspot.com.au/ - a blog where I feature indie and small press authors. Thanks so much for the interview! It was a lot of fun! Hope your readers enjoy it.